We were caught in the rain the other day! Mummy had put us out in the garden so we could run around and eat grass as usual, but the sun went behind some clouds and then it got darker. Some rain drops started to fall from the sky, not many so we ran around in it and had fun (it was a very warm day again). It was a bit like when we had a bath the other day, but warmer! Then mummy came out and took our cardboard tubes away, so we carried on running but before she came back for us it started to pour with rain so we jumped into our tents and sat there looking out. It was very funny watching everything get soaking wet while we were snug in our tents! After what seemed like a long time the raining stopped. We could see that mummy had got caught outside as well but had been sheltering under the patio roof so she was ok and not wet either. But Fred gave her a good long look and she came out and took us indoors, picking the whole of our tent up with us sitting in it. It was a fun way to travel. 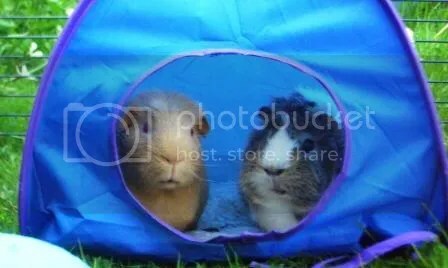 This is a picture of Fred and Victor in Victor’s tent the other day when Fred went visiting. You can see how snug the tents are. We like them a lot. George, you make it sound as if mummy neglected you, leaving you out in the rain to suffer. I think you guys had fun hanging out in your tents, right?